25 years ago, New York city was in decline. 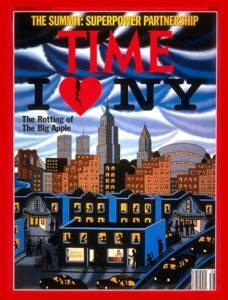 Rather than “The Big Apple”, TIME magazine dubbed the city “The Rotting Apple.” Crime levels were high, unemployment was rising and infrastructure was in a state of disrepair. What made the situation worse was that, rather than trying to return to the boom years of previous decades, New York’s residents were simply resigned to the fact that this situation was the new norm. The Mayor of New York at that time, Rudy Giuliani, was determined to pull the city out of its malaise by implementing an innovative policing approach based on the ‘Broken Windows’ theory first introduced by Wilson and Kelling in 1982. At its heart, the Broken Windows approach relies on the notion that to change behaviours – perception is everything. The theory states that by stamping out small crimes (such as vandalism, public drinking, and toll-jumping) the signal is sent that no criminal behaviour of any kind will be tolerated. An atmosphere of order and lawfulness is created, and more serious crimes are prevented from taking place. In New York, Giuliani told his police force to take a zero-tolerance approach to every crime, no matter how small. Famously he started to clamp down on squeegee men, subway fare dodgers, prostitution, public drinking, public urination and graffiti artists. In doing so, Giuliani signalled to the whole city that no criminal behaviour, however inconsequential, would be tolerated. He sent a clear message to the population that “this is the way things will be around here from now on”. In New York, a new standard of order and lawfulness began to be perceived by the population. Residents began to come out of their malaise and realise there was a better alternative to “it’s just the way things are“. 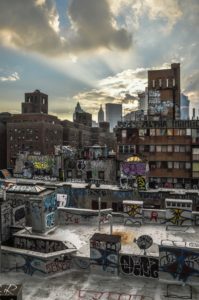 Whereas a hypothetical – or literal – ‘broken window’ (graffiti, prostitution, fare dodging) suggested disorder, negligence and a lack of cohesion, a city without any ‘broken windows’ suggested a culture of unity, social responsibility and strong values. The population started to regulate the new norm themselves. They began to exert a level of informal social control over those whose behaviour did not fit the standards expected in that community. Negative behaviours that were previously ‘acceptable’ became uncomfortable because the prevailing culture of the community had changed from one of disorder, negligence and lack of cohesion, to one of unity, social responsibility and strong values. The results of the ‘Broken Windows’ strategy in New York were impressive. The rates of both petty crime and serious crime fell dramatically and continued to fall for the rest of the decade. Part 4 of our Special Report outlines how we believe professional services leaders could apply a Broken Windows strategy in their own firm to improve the effectiveness of their training activities. Author Michael Levine has written an excellent book “Broken Windows, Broken Business: How the smallest remedies reap the biggest rewards” which outlines the Broken Windows theory in more detail. You can find the book here.